DESPITE being one of the most expensive bikes in the firm’s range the Tiger Explorer is Triumph’s top seller in the UK. And this spy shot proves it’s set to be heavily updated in the near future. The bike’s main components – the engine and frame – are unchanged but the bits bolted to them have been completely revised, including new suspension and brakes and a completely revamped electronics package. Last month we revealed details of a survey sent to Explorer owners discussing possible updates for the next version, and this bike incorporates at least some of those changes. The survey asked potential buyers to rate possible new features including semi-active suspension, cornering ABS and traction control and an electrically adjustable screen, and all of those things appear to be used on this bike. Starting with the suspension, the new forks look like the same WP units as used on the KTM 1290 Super Adventure. The KTM has semi-active suspension that reacts to surface changes, braking and acceleration, linked to multiple riding modes. 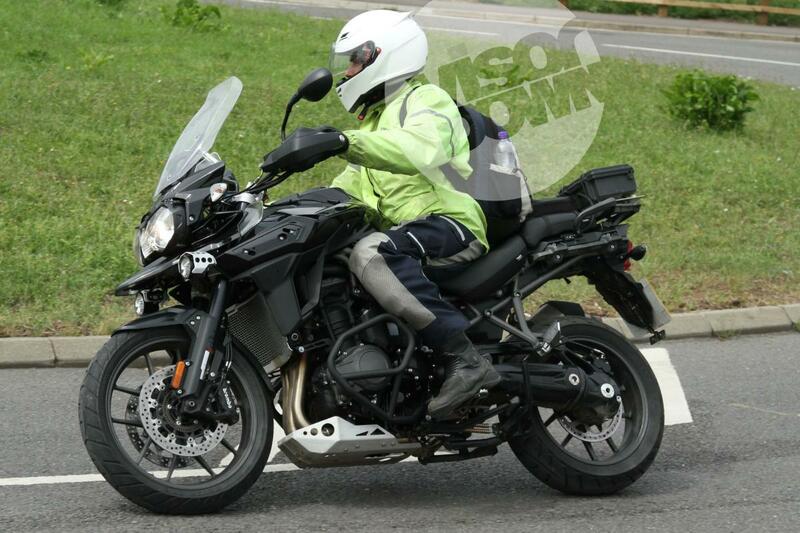 The addition of the same forks to the Tiger Explorer suggests it could get the same. At the bottom of the forks are Brembo radial brake calipers instead of the current Tiger Explorer's Nissins. The brake update seems very likely to include the addition of cornering ABS, which is also offered on the KTM and, for 2016, on the BMW R1200GS. The electric screen is part of a styling revamp that also includes new instruments, revised side panels and nose bodywork. While the survey also asked whether riders would prefer a larger fuel tank, it looks like the old unit is carried over to the next-gen bike. Surprisingly, given how finished this prototype looks, Triumph’s own website now lists the existing Tiger Explorer as a 2016 machine, so the new version could be planned as part of the firm’s 2017 line-up.